Did Marvel Comics Low-Key Launch a Prestige Imprint? By Zack Quaintance — Take out your tinfoil hat (or whatever), because I have a theory that might sound a little absurd: I think Marvel Comics is low-key running a new prestige imprint, one where creative teams are kept largely intact and allowed to tell stories independent of constant crossovers and editorial interference. Don’t get me wrong: I don’t think Marvel is stopping those bad habits. In fact, in sections of its line, it’s maybe worse than ever. Hunt for Wolverine and Return of Wolverine, with all due respect to the talented creators putting in work on those, has a foundation that feels like a direct order from someone in marketing who ran a focus group with 10 randos from the mall who all like Wolverine. Meanwhile, a pair of creators who freely voice opinions via social media have been unceremoniously dumped by editorial in recent weeks. Problems at Marvel Comics, however, aren’t what we’re here to talk about today. No, what we’re here to discuss is how amid corporate meddling and blatant cash grabbery, a surprisingly solid crop of titles that are concerned first and foremost with long-form narrative storytelling has begun to emerge, and—get this—it’s now been roughly six months or so and there’s nary a crossover in site. Wild. In recent years, Marvel has built a seasonal model for comics, rolling out line-wide renumberings roughly every 18 months, with new trade dress, titles, and creative teams, often announced on the same day. Earlier this year, however, the publisher tried something new. Dubbed Fresh Start, its latest initiative has been amorphous, with news of creative teams and titles trickling out slowly and with no clear start date or fancy new trade dress. In fact, I’m fairly certain the words fresh start have never appeared as a label on any Marvel Comic. Marvel’s low-key prestige imprint is, to be specific, a group of between eight and 12 titles. We’ll look at a list in a second, but it’s perhaps more telling to first look at which books aren’t included. Put simply, Marvel is still putting out plenty of comics feel like cash grabs, complete with insignificant crossovers and events. This month, it’s been Infinity War one-shots, with their namesake connection to the recent hit movie. They seem to have little (if any) impact on the actual comic book event of the same name (which has been strong). These are far from an isolated incident. In the months and weeks to come, we’re getting something called Spider-Geddon (this may be going on right now), so many weekly X-Men books, and a grab bag of other weekly titles too. There are new books that seem destined to end quickly and clear cash-ins on old ideas. Amazing Spider-Man by Nick Spencer, Ryan Ottley, and Humberto Ramos: Even in the midst of Spider-Geddon, Marvel’s flagship Spider-book skates by untouched. Avengers by Jason Aaron, David Marquez, Ed McGuinness, and more: Aaron is Marvel’s best long-form writer, and they know this, giving him space to do his thing with their flagship team. Black Panther by Ta-Nehisi Coates & Daniel Acuna: When you have a winner of a National Book Award willing to write your comics, give him space. That’s exactly what Marvel has done. Fantastic Four by Dan Slott & Sara Pichelli: Most-telling about Marvel’s interest in getting this book right is they’ve pushed the third issue a month. Immortal Hulk by Al Ewing and Joe Bennett: This is a runaway hit, a deeply scary and cerebral take on a long-tenured superhero character. This book is being widely praised by critics (myself included). Look for it to win Eisners next year. It’s that good. Ms. Marvel by G. Willow Wilson and Nico Leon: Thor aside, Ms. Marvel is Marvel’s strongest long-term ongoing, and a beast in trade sales. May it live long. The Punisher by Matthew Rosenberg and Szymon Kudranski: I’ve been blown away by these first two issue. Rosenberg and Kudranski are a perfect pairing for Frank Castle. 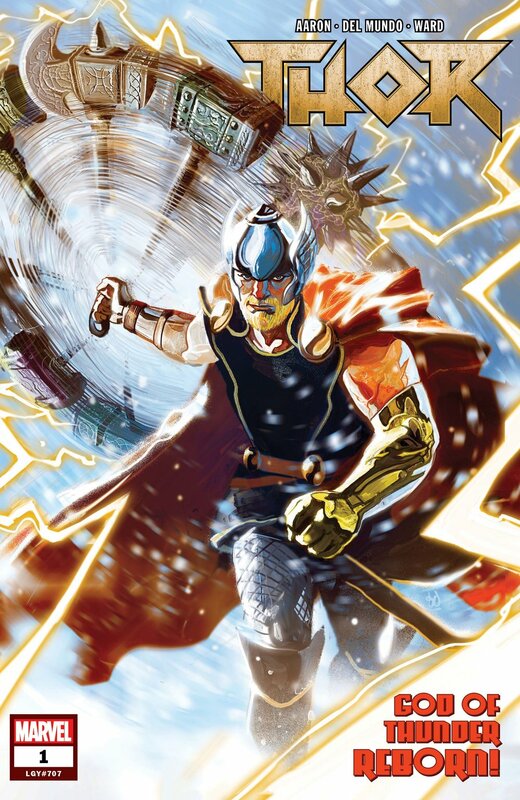 Thor by Jason Aaron and Mike Del Mundo: This is, simply put, the best ongoing long-form run in all of superhero comics. Tony Stark: Iron Man by Dan Slott and Valerio Schiti: See the above note about Fantastic Four because it applies here, too. Venom by Donny Cates and Ryan Stegman: Cates is Marvel’s fastest-rising writer. He’s had great success with brief runs on titles like Thanos and Doctor Strange, and now with Venom he’s proving to be great on a longer running book too. X-23 by Mariko Tamaki and Juan Cabal: The X-line is super chaotic, but this book is seemingly being kept out of the fray of the main line. The thing about these titles is that except Black Panther and Thor, none existed in their current iterations six months ago, and so it remains to be seen how Marvel will handle these books long-term. A massive, presumably line-wide event—War of Realms, coming next year in Thor—has been announced, and it seems likely some of these books will participate. If that happens, fine. War of the Realms has been expertly built over the course of like half a decade— merits line-wide participation. In terms of the future, I also see other titles likely to join this crop. Iron Heart and Miles Morales Spider-Man are both incoming and could rise, and, heck, maybe even an X-Title could emerge too. The real test of my theory, though, will be taking stock at this time next year, to check how many of these creative teams remain intact (or at least just the writers), and to see how many have had their narratives disrupted by crossovers, events, or spin-offs. Here’s hoping we can count them on one hand.